There is nothing better than having great friends. And we have a ton of them. Through the mayhem of the last seven months it’s easy for us to realize how many awesome people have been so helpful to all of us. We want to thank all of you, but aren’t quite sure how. Not only did Clay give us the venerable tarp garage that covered our rescued items for the summer while we sifted through them, but he was there to help coordinate the demolition while I had to be out of town for work, and in general was an overall huge help. Smell is a very strong sense. When we were sifting through things that came out of the house, many were only slightly damaged. But the smell would trigger all kinds of awful feelings. And the smell is nearly impossible to get out of most things. In many cases, the decision to toss items was based on their odor. So whether things actually burned up, or were just destroyed to us, we lost of lot of possessions in the fire. 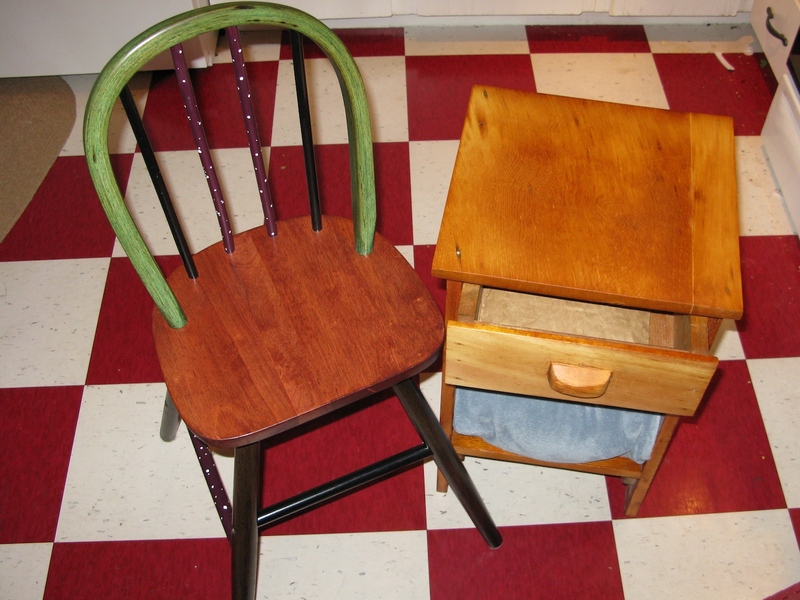 Two of these items were Meadow’s favorite chair and Laura’s end table that her dad built when he was young. Both were blackened, cracked and up until now I assumed in the landfill with everything else.